Gastritis is an inflammation of the lining of the stomach. The inflammatory lesions may be either acute or chronic. Gastritis is actually the medical term for almost any stomach upset, sometimes also referred to as gastroenteritis. Gastritis refers to a common inflammatory digestive condition that affects the stomach lining but is not a disease in itself. It is a health condition that could be brought on by some other disease as a symptom or it could have various other causes. Gastritis is characterized by the development of severe cramping or pain in the stomach or upper abdomen. This symptom of gastritis is often referred to as dyspepsia. Gastritis may be of two types, with the sudden and brief occurrence of gastritis referred to as acute gastritis, while the more persistent variety of the condition is referred to as chronic gastritis. Chronic gastritis may be present because of another health condition. Gastritis or stomach upsets that develop due to the consumption of alcohol or certain medications like aspirin are classified as acute gastritis. The symptoms that point to acute gastritis can be worrying in children, but treatment with natural methods should suffice. On the other hand bacterial infections caused by bacteria like Helicobacter pylori cause infections of the stomach that may result in chronic gastritis. Chronic gastritis may also be due to conditions like peptic ulcers, but it should also be noted that chronic gastritis can cause a development of ulcers over time. Chronic gastritis treatment should never be neglected as it can also increase the risk of developing stomach cancer. Do not attempt to treat even mild chronic gastritis with natural treatments or chronic gastritis remedies alone, as you would need medical advice for an accurate diagnosis in the first place. Gastritis is one of the most common of all medical conditions, for which help is sought, with up to 10% of all visits to hospitals with abdominal pain being diagnosed as gastritis. In most cases where there is no serious underlying condition gastritis diet treatment should suffice, providing relief from gastritis symptoms and helping cure the infection. The main symptoms of gastritis are loss of appetite, nausea, vomiting, headache, and dizziness. There is pain and discomfort in the region of the stomach. Other symptoms are a coated tongue, foul breath, bad taste in the mouth, increased flow of saliva, scanty urination, a general feeling of uneasiness, and mental depression. In more chronic cases, the patient complaints of heartburn and a feeling of fullness in the abdomen, especially after meals. Often there is constipation, but occasionally, there may be diarrhoea due to intestinal catarrah. Keep in mind that the gastroenteritis symptoms may not always reveal the true extent of physical changes and damage to the lining of the stomach. An examination conducted with an endoscope, using a tiny camera can help doctors examine the stomach lining for an accurate diagnosis. At times severe gastritis may be present without the symptoms developing, while in other cases symptoms of severe gastritis may surface despite only minor changes to the stomach lining. Elderly individuals need to be particularly cautious as symptoms are less likely to develop in them, with there being no nausea, vomiting or abdominal pain and they may simply take ill without warning, experiencing internal bleeding. The appearance of pain, abdominal cramps or great uneasiness in the region of the upper abdomen would be the most general symptom of gastritis. Gastritis pain usually tends to appear in the left upper region of the stomach and back. This pain appears to radiate through and through. The pain from gastritis is often described as burning or a feeling of soreness; this pain could however be sharp and stabbing. Frequent belching that does not help relieve the abdominal pain, but may relieve it temporarily. Depending on how severe the stomach inflammation is there may appear clear or greenish or yellow vomit. There may also be blood in the vomit. • Belching: This would not commonly relieve any pain. If it does, it would do so only for a short period. • Vomiting and Nausea: The vomit would appear green, yellow or clear, blood-streaked, or completely bloody. This would also depend on how severe is the inflammation of the stomach. • The sensation of bloating and fullness is another common experience for gastritis patients. There may also be some feeling of burning in the area of the upper belly. • The patient would probably experience shortness of breath and a feeling of faintness. • In addition to the severe abdominal pain there may also be some chest pain. • Severe or chronic gastritis may cause the vomiting of significant quantities of blood. • There may also be traces of blood in bowel movements. Besides one may also notice the stools to be dark and sticky, smelling exceedingly foul. These symptoms of severe gastritis will not necessarily develop gradually but there could be a sudden onset of these dramatic symptoms, particularly in those past the age of 60. The most frequent cause of gastritis is a dietetic indiscretion such as habitual overeating; eating of badly combined or improperly cooked foods; excessive intake of strong tea, coffee, or alcoholic drinks; or habitual use of large quantities of condiments and sauces. Other causes include worry, anxiety, grief, and prolonged tension, use of certain drugs, strong acids, and caustic substances. Digestive disorders are the main cause of gastritis troubles. Improper bowel movements can be treated with the aid of balanced diet to treat severe gastritis. Have a sigh of relief with the treatment of gastritis. 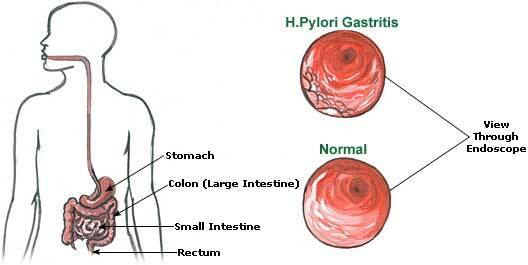 Helicobacter pylori is a bacteria most commonly found to be responsible for chronic gastritis. The bacteria are thought to be present in most of us and believed to be widely passed on, but it does not cause any health problems in most cases. In some cases however it may cause severe damage to the stomach lining, breaking down its inner protective. The reasons for which these bacteria affect some people while others remain unaffected is not clearly understood. It is likely that other causes like stress could make one more vulnerable to the infection. The regular use of pain killers and non steroidal anti inflammatory drugs can cause either acute or chronic gastritis. The excessive consumption of alcohol can cause severe irritation to the stomach lining, damaging it and leaving it vulnerable to infections with a high likelihood of gastritis developing. Occasional or rare consumption of excessive alcohol is however more likely to cause acute gastritis. Bile reflux diseases may also cause gastritis as bile may flow into the stomach instead of into the small intestine. This could cause inflammation and a condition of chronic gastritis. One of the other common causes of gastritis may be autoimmune diseases wherein your body’s immune system attacks cells of the stomach lining itself. Certain connective tissue disorders or specific medical conditions like Crohn’s disease and AIDS may also cause the growth of chronic gastritis. Rice gruel is another excellent remedy for acute cases of gastritis. One cup of rice gruel is recommended twice daily. In chronic cases where the flow of gastric juice is meagre, such foods as require prolonged vigorous mastication are beneficial as they induce a greater flow of gastric juice. The patient should undertake a fast for two of three days or more, depending on the severity of the condition. He should be given only warm water to drink during this period. This will give rest to the stomach and allow the toxic condition causing the inflammation to subside. After the acute symptoms subside, the patient should adopt an all-fruit diet for the next three days and take juicy fruits such as apples, pears, grapes, grapefruit, oranges, pineapple, peaches, and melons. Yoghurt and cottage cheese should be used freely. Too many different foods should not be mixed at the same meal. Meals should be taken at least two hours before going to bed at night. Eight to ten glasses of water should be taken daily but water should not be taken with meals as it dilutes the digestive juices and delays digestion. Above all, haste should be avoided while eating and meals should be served in a pleasing and relaxed atmosphere. He may, thereafter, gradually embark upon a balanced diet consisting of seeds, nuts, grains, vegetables, and fruits. From the commencement of the treatment, a warm-water enema should be used daily for about a week to cleanse the bowels.The patient should be given dry friction and a sponge daily. Application of heat with a hot compress or hot water bottle, twice a daily, either on an empty stomach or two hours after meals, will also be beneficial. The patient should not undertake any hard physical and mental work.He should avoid worries and mental tension. He should, however, undertake breathing and other light exercises like walking, swimming, and golf.